James and Luke skiing the Col des Cristaux. Rappelling the top 15 meters of this face last April I was determined to come back and complete the line. After a few recent outings with James and Luke they were keen to come and have a go at this with me on Monday morning. Taking the high right hand traverse down to the Argentiere glacier it was already getting warm, thankfully there was a nice breeze when we started skinning so things didn’t get to hot. The bootpack was well established and reconsolidated by three climbers who were heading up just 50m ahead of me, we made good time up the face. The gentle breeze that cooled us on the valley floor had slowly grown in to constant wind with strong gusts that would catch you off guard if you were not paying attention. 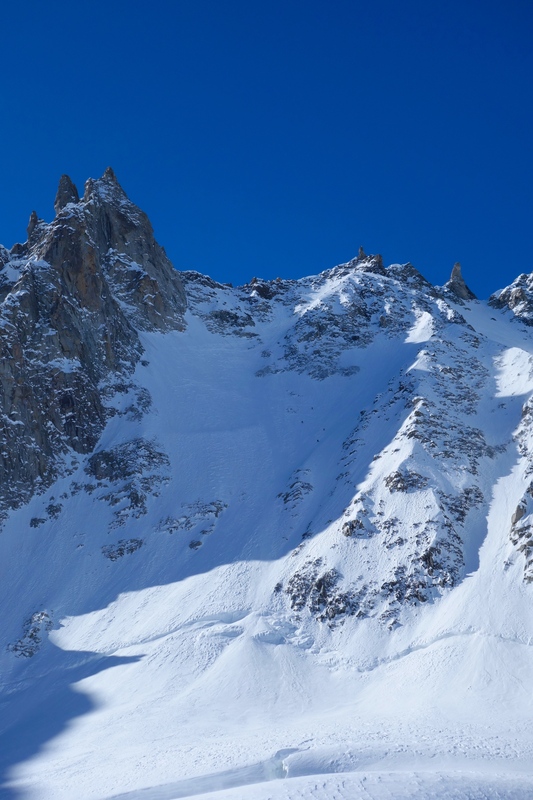 The winds coupled with loose snow resulted in constant spin drifts and powder avalanches, which convinced Luke and James they should think about heading down. After they made up their minds they shouted up to me and I didn’t take much convincing to turn around about 100m below the top of the 600m face. Making a platform to put my skis on was a long drawn out affair with the wind filling it back in with snow and things getting very cold. Making my first few turns on the 45′-50′ slope in 6-8 inch high sastrugi was very daunting and it wasn’t too long before I opted to side slip the wind blown snow and neve down to James and Luke who were taking shelter under a cliff. After a quick stop with the boys I headed down skiers left trying to find some skiable snow. There was some snow that had not been too affected by the wind but turns were seldom as it was so variable and unpredictable. Making my way down with a dozen or so turns and some fast side slipping I was down and over the bergschrund. After picking up all the skins and ropes we left at the bottom I headed towards the sun in an attempt to warm my hands up after only bringing soft shell gloves for this ‘spring’ ski. Sitting in the sun I waited for James and Luke to get down, they contemplated down climbing but soon changed their mind when they saw that I skied it. Upon their arrival to my sunny spot we headed straight back to Grands Montets to grab a beer in the sun, where surprisingly there was not a breath of wind. A huge change from the face a few kilometers up the Glacier.